1. Set 1 of the oven racks on the lowest shelf and preheat oven to 350ºF. 2. Line a baking pan with parchment paper. Make 8 (2-inch) balls out of aluminum foil. Spray 3 wire cooling racks with non-stick cooking spray and place 1 of the aluminum balls in each of the corners of 2 of the racks. 3. Lay 1/3 of the chips on one of the racks. 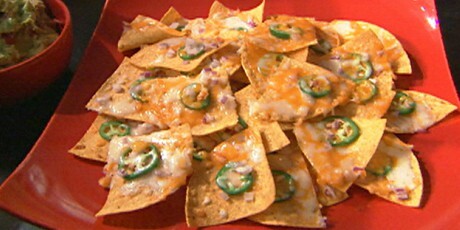 Top each chip with a jalapeno slice and sprinkle the chips with 1/3 of the red onions, and 1/3 of both the Cheddar and Oaxaca cheeses. Repeat with the remaining chips and the other 2 racks. Stack the racks on top of one another and set into the parchment lined baking pan. Bake in the oven on the bottom rack for 7 minutes or until the cheese begins to bubble. Sprinkle with fresh oregano. Serve immediately with the salsa, sour cream, and guacamole.